Germany, France, Netherlands, Belgium, England, Denmark, Poland, etc. Logistics specialists of our company will help you to choose the best solution taking into account your shipment parameters. You can send your request to us here. 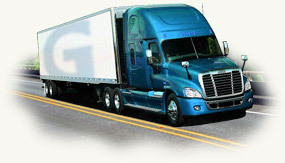 Using 2 drivers to optimize delivery transit time. Long-term relations with major international trucking companies and detailed market analysis give us the possibility to secure competitive rate levels. We also monitor situation on borders which helps us to choose the best routes and ability to deliver cargo as fast as possible.